The Lenovo Vibe K5 measures 142 x 71 x 8mm, identical to the K5 Plus. This makes it a standard-issue 5-incher in terms of size. Marginally more compact in footprint, the Xiaomi Redmi 3 is slightly thicker, with a larger battery to show for it. The Galaxy J2 (2016) is virtually the same as the K5, while the Oppo F1 is a millimeter taller, but a fraction of a millimeter thinner. 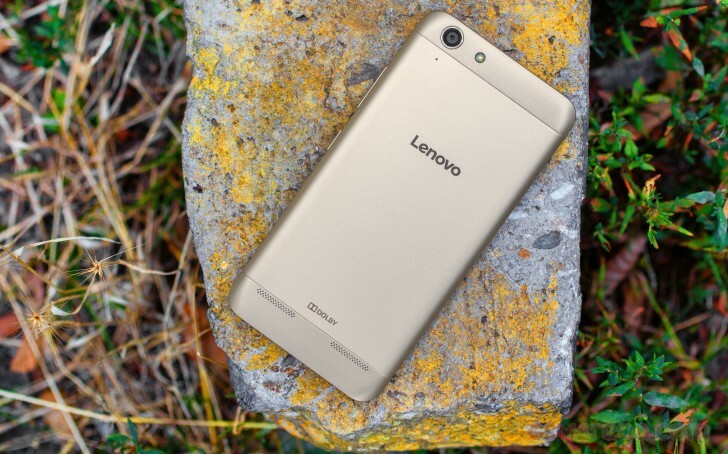 The Lenovo Vibe K5 is an entry level phone, but you can't tell by just looking at it or holding it in hand. Part of the reason is the metal back, which adds an unexpected touch of premium. Sure, it's a no-nonsense design that looks just like the next phone, but it's hard to find fault with the Vibe K5's looks, especially considering its price. And, as is customary with metal-backed phones, the K5's rear panel isn't entirely metal, there are two plastic bits top and bottom. Typically, those are used to allow the antennas to pick up signal, but on this particular model it would appear that the metal cover itself acts as an antenna - there are contacts on both sides, as well on the inside above the battery. The plastic bits get cutouts for the camera lens and flash in the top one, and the speakers in the bottom. There are in fact too speakers, which is another surprising feature in a smartphone this inexpensive, when even many flagships still make do with just one. The cover is removable and comes off together with the sides, buttons and all. There's a groove in the bottom right corner to get it started, which isn't the easiest task. Once you do, the panel is out of the way in an instant. Underneath the cover, you get access to the removable battery, the two microSIM slots and the dedicated microSD slot. The speakers can be seen below the battery too. Nothing out of the ordinary on the front either - the 5-inch display is 720p here, unlike on the Vibe K5 Plus, but with the power off it looks essentially the same. Bezels aren't exactly minimal and there's also a black outline around the display itself, but those would be grounds for complaints on a more expensive phone - here it's par for the course. The entire face of the phone is defined by a shiny frame, which serves to protect the edges of the glass, and also as tactile clue where the display ends. It's quite obviously made of plastic, but when did we get so picky. The bottom bezel is home to the capacitive keys, which have icons etched in the front panel. They aren't backlit, though. Above the display there's the earpiece in the middle with the front camera and sensors on either side. There is a notification LED in the right corner here. Other phones have card slots on the sides, but the Vibe K5 keeps them tucked underneath the rear cover. Hence there's not much going on here, other than the power button and volume rocker on the right side. The bottom is similarly minimalist - nothing but a primary mic can be found there, as Lenovo likes to put the microUSB port on top on its budget models. The 3.5mm jack is on top, too. A 5-incher is always going to be easier to handle than phablets and the Vibe K5 is one of the former. The gentle curves on the back do add a bit of comfort, but it's still quite slippery thanks to the fine satin finish on the back.